Do you have a fresh idea for building a welcoming, inclusive community? Does your idea include an entrepreneurial plan for developing a sustainable source of income? Will your idea work in South Charlotte — a thriving region that crosses the North/South Carolina state line? Would a bit of funding help get your idea off to a running start? On Easter Sunday 2017, Charlotte’s 100-year-old Holy Covenant United Church of Christ launched a search for proposals. We’re seeking fresh ideas for 21st-century ministry to be located in the greater south Charlotte area. Winning proposals will receive start-up funding from our progressive church’s Pilgrim Legacy Fund and be sustained over the long term by social entrepreneurism. If you have a great idea, we want to hear about it! In the 1960s, a group of south Charlotte families formed Pilgrim Congregational United Church of Christ — the third UCC church established in the city since Holy Covenant’s predecessor church was formed downtown in 1906. First meeting in a school, then in a donated house, the congregation eventually built a sanctuary on its property and leased the original house to an active recovery community. Over the years, Pilgrim was served by a succession of pastors — but by the early 2000s, the congregation had grown smaller and its membership older. In 2012, Pilgrim merged its congregation with Holy Covenant, continuing to worship as Holy Covenant’s South Campus with support from members of the larger church. In 2015, the merged congregation decided to close the second site and sell the south Charlotte property, with the understanding that 90% of the net sales proceeds would be set aside to establish The Pilgrim Legacy Fund — an endowment whose earnings would help fund new ministry in south Charlotte. A team was recruited to develop a strategy for the new initiative, and after a year of research, discernment and discussion, the team determined to cast a wide net — seeking proposals from anyone with fresh ideas for ministry. The proposal process launched Easter Sunday of 2017, with a goal to identify by year-end at least one new ministry to be funded for up to three years. Click the PDF icon on the right to download the press release announcing the ministry proposal initiative. And click here to learn more about Holy Covenant UCC. That’s not to say a new ministry must focus on all of these values — but any proposal we accept will be guided by and attentive to these non-negotiable values wherever relevant in the ministry’s mission and program. To learn more, visit Holy Covenant’s website and that of the United Church of Christ. The field for proposals remains open to a broad range of innovative ideas, whether establishing a new program or expanding an existing initiative. All proposals are expected to reflect the values of the United Church of Christ — values that include social justice, equality, creation care, peacemaking, inclusion, radical welcome and interfaith understanding. While the sponsoring church lives in the Christian tradition, ecumenical and interfaith proposals are welcome. Grants may be offered in any amount up to $100,000 annually, at Holy Covenant UCC’s sole discretion. Grant amounts offered will be based on a range of factors, including the scope of the project and the experience of project leadership. All grants will be awarded for one year, and application for renewal may be made for two successive years. 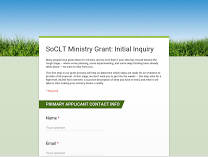 Funded grantees will be expected to report regularly to Holy Covenant UCC, which will identify a team to act as a board of directors to oversee all funded projects. The team will not become involved in day-to-day management, but will provide guidance and support to funded project(s) as appropriate. Proposal criteria and guidelines may be revised without notice by Holy Covenant UCC. How will your idea bring positive change to the world? Two or three finalists will be invited to Charlotte to present their proposals on-site at Holy Covenant UCC. The weekend will include gatherings with the church leaders and the Review Team, a full day of interviews, and an opportunity to worship with the Holy Covenant community on Sunday. Reasonable travel expenses will be covered by the Pilgrim Legacy Fund, and the weekend will be mandatory for grant funding. Our Review Team will consider Initial Inquiries on a rolling basis, and aim to respond within 30 days — so the sooner you submit your Inquiry, the more time you’ll have to prepare your full Proposal should your idea be selected to move forward. Initial Inquiries will be reviewed on a rolling basis, and proposers of ideas that evidence a good concept and strong preparation will be invited to submit a full proposal. If you’d like a sneak peek at what a full proposal will require, click here to download a PDF version.